Like the old Wall Street saying goes, you can’t catch a falling knife — and this is a particularly sharp one. Even after deploying more than $400 billion of public money and enforcing the aid of many private firms, Beijing is having a hard time propping up share prices in Shanghai and Shenzhen. After their initial plunges, stocks are on a roller coaster ride as investors try to anticipate the government’s next buying spree. To outsiders, it seems like chaos. But to China, it makes perfect sense. Americans are plenty familiar with bailouts after the global financial crisis almost brought down giants like General Motors and AIG. 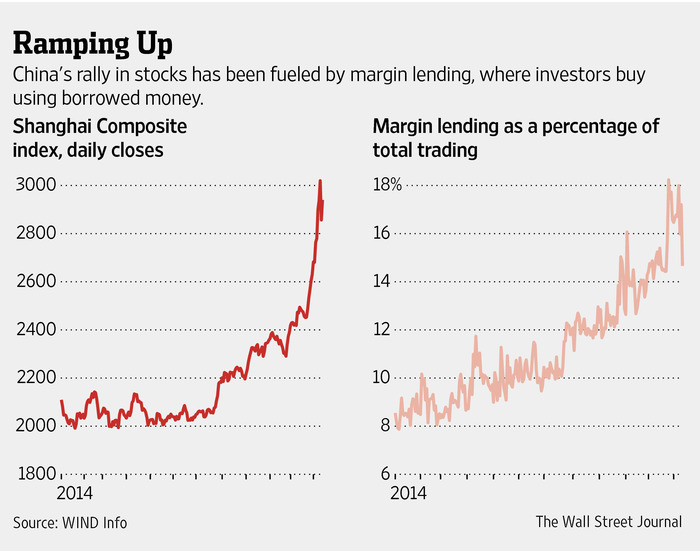 But even if the Chinese bailout worked, and stock prices stabilized above their lows, economists would cry foul. By insulating investors from the ups and downs of an open market, China has essentially created an even greater appetite for risk. Confident that the government has their backs, they’ll trade even less responsibly, taking on more leverage with money they don’t have. This is moral hazard, and China is generating a lot of it. In the meantime, China is also doing its best to make life difficult for foreign investors. The state-controlled media has accused them — apparently without evidence — of causing the dive in share prices, in part by betting that the markets would fall further. Some foreign accounts have been frozen altogether, including one belonging to Citadel Securities, an affiliate of one of the biggest hedge funds in the United States. Yet relaxing restrictions on foreign money might have been one of the only ways to support stocks without intervening directly. So foreign economists are wringing their hands, and foreign investors are understandably peeved. By contrast, Beijing is unfazed. To understand why, you have to put yourself in the shoes of a Chinese leader — and also of a Chinese investor. As the media have been reporting for months, the majority of Chinese investors who fueled the stock bubble are poorly educated and inexperienced, with relatively small portfolios. These are exactly the people on whom Beijing’s power depends. They have experienced China’s rising economic tide, and they expect to benefit from it as well. They tend to support the government as long as they get their share of the spoils; this is the social contract upon which Beijing relies. But these Chinese haven’t received much training on how to navigate the financial system. For them, trading on the margin may have seemed like gambling with house money as the markets climbed ever higher; now they could lose their houses. If these small investors do lose everything, then the social contract — as Beijing has long led them to understand it — will have been breached. The government can’t allow that to happen. Beijing must be seen to have the investors’ backs. And if it can cast some blame on the foreigners who would corrupt their citizens’ unsophisticated minds with notions of economic and political freedom, so much the better. The cost is almost immaterial, when the support of an entire generation may be at stake. And China’s leaders don’t care what wiser voices may say, even within the country’s own borders; the citizens who are questioning the government’s policies now probably weren’t its strongest supporters in the first place. The key is to maintain the quiescence of those who were. Won’t all this set Chinese financial development back a couple of decades? Not necessarily. China is moving through economic time at breakneck speed. Even with their restrictions on cash flows and foreign involvement, its capitalist institutions are growing so fast as to outpace the education of its people — as well as the government’s ability to monitor and regulate. Where officially sanctioned markets and exchanges haven’t yet appeared, black markets and shadow economies have. The growing pains should be all too recognizable for us. In the United States, Wall Street panics used to be fairly regular occurrences, with five between 1884 and 1907 alone. Some of these crashes had to do with the globalization of financial markets, others with the unanticipated effects of regulation, and still others with random catastrophes. In a given year, modern China may have to deal with any or all of these factors. This will not be the last big bailout we see. The main risk for Beijing now is that the oceans of cash it has plowed into stocks will end up in the wrong people’s pockets. If all those undereducated investors were driven out of the markets by falling prices and margin calls, then only the bigger and more sophisticated investors would have remained to feel the boost. As Alice de Jonge of Monash University has pointed out, the end result may just have been a huge transfer of wealth from middle- and working-class Chinese to those who were already wealthy. Then all that money would have been better spent on a boring old social safety net — something the United States learned, too, after only 150 years. Did SARS Prepare East Asia for Ebola?